The rules are based on the Full Tilt GW game and should be read through, but they are by no means identical with the above mentioned rules. Your Knight will be jousting one random adversary each round. The joust consists of three goes with the lance. After the three passes the winner is the one who scored the most broken lances on his opponent or unhorses his opponent. In case of equality, the knights shall make one more pass, until a victor is decided. All Knights will be considered having Hero statistics in the tournament. This means that Knights will hit others on a 4+. The only exception is the number of wounds, namely 3. A Knight's equipment shall consist of a set of heavy armor, a shield, three lances as well as a barded warhorse. It is, of course, against a Bretonnian Knight's code of honour to use any magic items in the tourney itself. This is a rule which no worthy Bretonnian would even consider breaking, for to do so would besmirch the Knight's honour and bring shame to his family. Only one roll to hit will be allowed in each pass. If the to hit roll succeeds, the Knight will be allowed a roll to wound. All Knights will wound others on a 2+ with the lance. If you roll a successful hit with your lance and wound you are considered to have broken your lance even if the wound is saved. Armour saves will be made with a -3 due to the strength of charging with lances. This means that Knights will usually save on 5+. 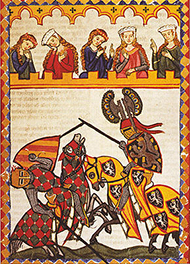 A wounded Knight will be unhorsed on a further roll of 1,2 or 3(if wounded by a lance). The tournament shall be fought à plaiseance, with blunted weapons. Wounds shall not kill the participants, and heal faster than wounds caused by weapons of war. Each knight that progresses to a further round heals only one wound (thus, if a knight wins a round and has suffered two wound, he would heal one wound until the next round). Knight's, Questing or Grail Vow:Every Bretonnian Knight has one of these Vows, but they have no further effect on the joust. Virtue of Devotion: This virtue gives a Knight an automatic lady's favour, entitling him to three rerolls. The rerolls will automatically be used for the first three failed rolls. Virtue of Discipline: A Knight with this virtue will get a +1 to his armour saves. Virtue of the Impetuous Knight: This virtue will allow the Knight to count his tactics choice as the choice above it in the list when it comes to deciding who strikes first. Example: If the Knight chooses to aim for the helm he would normally strike after someone aiming for the shield, but in this case their attacks will be simultaneous. Virtue of Knightly Ardour: This virtue entitles the Knight to a +1 modifier to his strength, thus lowering his opponent's save by one point. Virtue of Knightly Temper: This virtue entitles the Knight to reroll any failed to hit roll in the first pass of each round. Virtue of Noble Disdain: A Knight with this virtue will automatically disregard the first wound he suffers each round. Virtue of Purity: A Knight with this virtue will never use the Swipe or Dodge tactics but he will be able to reroll any failed armour saves. Virtue of Valour: A Knight with this virtue will automatically have a random lady's favour. The rerolls will automatically be used for the first failed rolls. Virtue of the Joust: A Knight with this virtue will never use the Dodge tactic, but will always have a +1 modifier to hit. Double 1s - Veil: This favour entitles the Knight to one reroll. The reroll will automatically be used for the first failed roll. Double 2s - Wimple: This favour entitles the Knight to two rerolls. The rerolls will automatically be used for the first failed rolls. Double 3s - Kirtle: This favour entitles the Knight to three rerolls. The rerolls will automatically be used for the first failed rolls. Double 4s - Girder: This favour entitles the Knight to four rerolls. The rerolls will automatically be used for the first failed rolls. Double 5s - Garter: This favour entitles the Knight to five rerolls. The rerolls will automatically be used for the first failed rolls. Double 6s - Tress: This favour entitles the Knight to six rerolls. The rerolls will automatically be used for the first failed rolls. The joust is conducted in rounds. In each round the contending Knights make a number of passes to decide the winner. Each pass is started by choosing one of the following jousting tactics. The tactic chosen will decide who strikes first and might also bestow other bonuses. Contestants choosing the same tactic will strike each other simultaneously. 1. Aim for Shield: This tactic allows you to strike first. 2. Aim for Helm: This tactic gives your Knight a +1 modifier to his strength, thus lowering his opponent's save by one point. He will strike before an opponent aiming for his crest, making a swipe or a dodge, but he will strike after an opponent aiming for his shield. 3. Aim for Crest: Knocking your opponent's crest off counts as two broken lances. You will be at -1 to hit and can never wound or unhorse your opponent. If you hit the crest it will be knocked off on a further roll of 4, 5 or 6. This tactic allows your Knight to strike before anyone making a swipe or a dodge, but after anyone aiming for the shield or helm. Note that each Knight only has one crest and that after it is knocked off it will no longer be an eligible target. Crests are however mended between rounds..
4. Swipe: This tactic is acceptable, but not considered very honourable. It will give you a +1 modifier to hit. You will strike after anyone using tactics 1, 2 or 3, but before anyone using a dodge. 5. Dodge: This tactic is defensive and you will strike last. It is considered dishonourable and will probably bring down hisses from the crowd. Your opponent will get a -2 to hit modifier and you will get a -1. This tactic can just be used once per round. A Knight using this tactic twice in the same round will be disqualified from the tournament for cowardice.